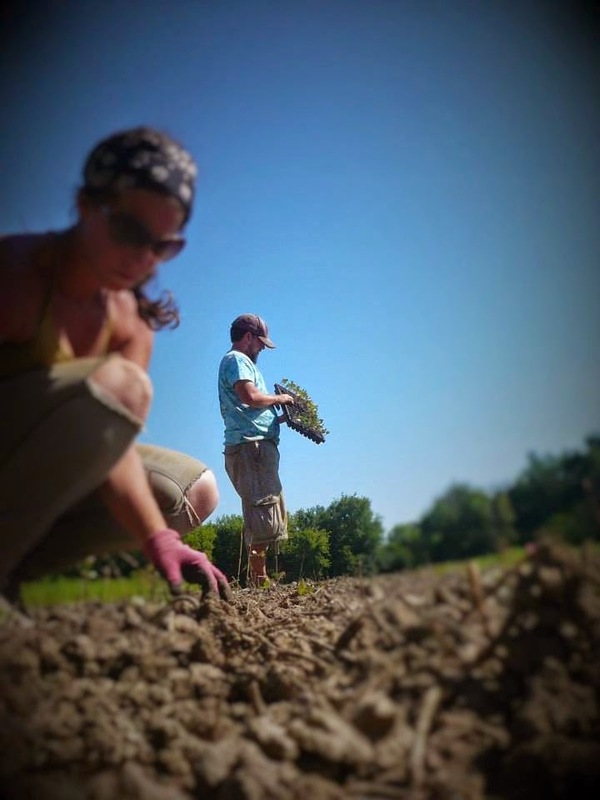 Meteorological summer is underway, and we've been sweating our butts off in the field getting things in the ground. This time of year on the small veggie farm is always a planting onslaught. On top of that, the rapidly warming soil temperatures help make more nutrients available to the plants, speeding their growth--and when we're talking about plants, we are also talking about weeds. So, while we are happy to be emptying the greenhouse of plants and burying seeds in the field, we also have our eyes on those unwanted weeds growing bigger day by day, and really can't wait to free up significant time to dig our hoes into the field in earnest. It's always a balancing act, but this time of year, planting often wins out. Things are going well overall after a very slow start to the growing season. The new land has really heavy clay soil that retains water like you wouldn't believe, which, after the heavy snow pack left from our crazy winter, took forever to dry out. With the addition of a few drenching rains in April, we were about a month behind in getting some of our crops out because working wet soil can ruin growing conditions for years. So, we just had to wait it out--and learn how to adapt to the heaviest soil either one of us has seen in all our years farming all around the continent (which is saying something). But we think we're learning the land's quirks and adjusting our methods to best utilize this beautiful piece of Winfield. Nearly all of the spring and summer crops are already in the ground, and some of the fall crops are being started in the greenhouse right now. Stay tuned!